I may be stupid, but I’m not crazy, and when certain people bring plants to plant sales, well, look out, because I might just knock you down to get to the plants. Way back in the last century a very well-known horticulturist, who in my opinion possesses the most exquisite taste of any gardener known to me, brought a bunch of plants grown from seed to one of the plant sales hosted by the Rocky Mountain Chapter of the North American Rock Garden Society almost all of which went home with me that day. I hesitate to name the person in question just in case I actually did knock them down, and the last thing I need is an army of lawyers coming to my door, unless they happening to be gardening lawyers who would have sympathy with my case. One of the plants was a rose grown from seed collected in the wild (somewhere in Central Asia) by Josef Halda, and was labeled Rosa aff. kokanica. A rose with affinities to the species kokanica. A mystery rose from Central Asia. The Silk Road. Camels. The cry of the muezzin calling the faithful to prayer. Vast landscapes surrounded by mountains twice as tall as the Rockies. Then it bloomed. White flowers, as is fairly evident from the picture. Flowers with a sweet scent, slightly tinged with the aroma of linseed oil, like Rosa foetida. And swarming with bees; you hear the rose before you see it. 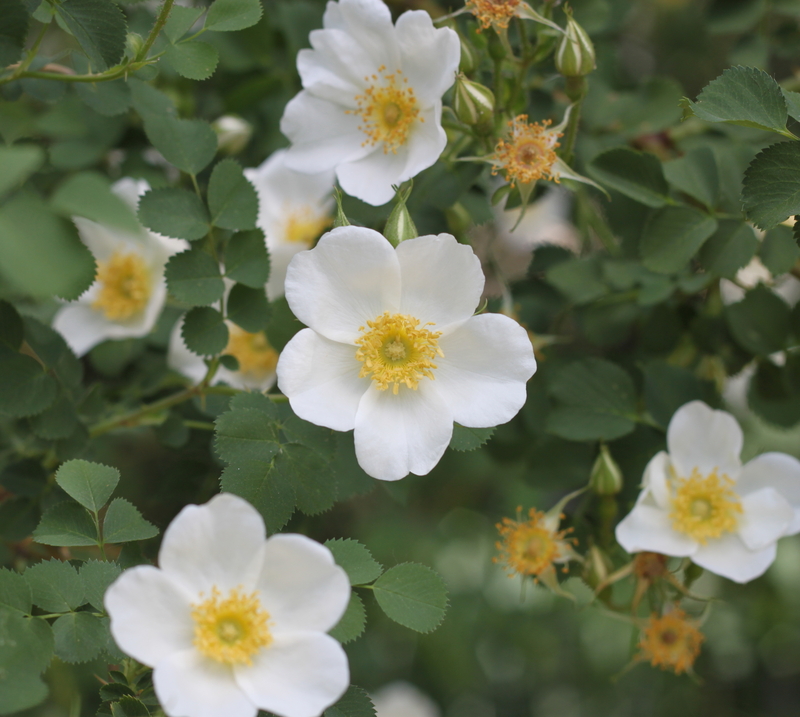 Thinking that Rosa kokanica had yellow flowers (because that’s what the books say), I decided this was R. fedtschenkoana instead, reading about its “leaden gray leaves” and white flowers. So I referred to it that way for many years. After all, calling it aff. kokanica admits of uncertainty, and no doubt, even with a person as august as Halda, there could be the chance of error when collecting seed from a rose long out of flower. But still …. So today, after scraping up all the hideous bluegrass and revealing the path in all its glory (oh, the metaphor! ), I turned my scholarly attention to the rose. Why not actually look something up for once? I did. Rosa fedtschenkoana, “branchlets terete, prickly; prickles yellowish …etc.” (You don’t come into this garden and talk about the “thorns” on a rose. They are prickles.) More importantly, when we get to the leaflets, “margin simply serrate”. On to Rosa kokanica where we find “petals 5, pale yellow or white” but even more interestingly, with the leaflets’ “margin acutely doubly serrate”. I picked one and took its picture. 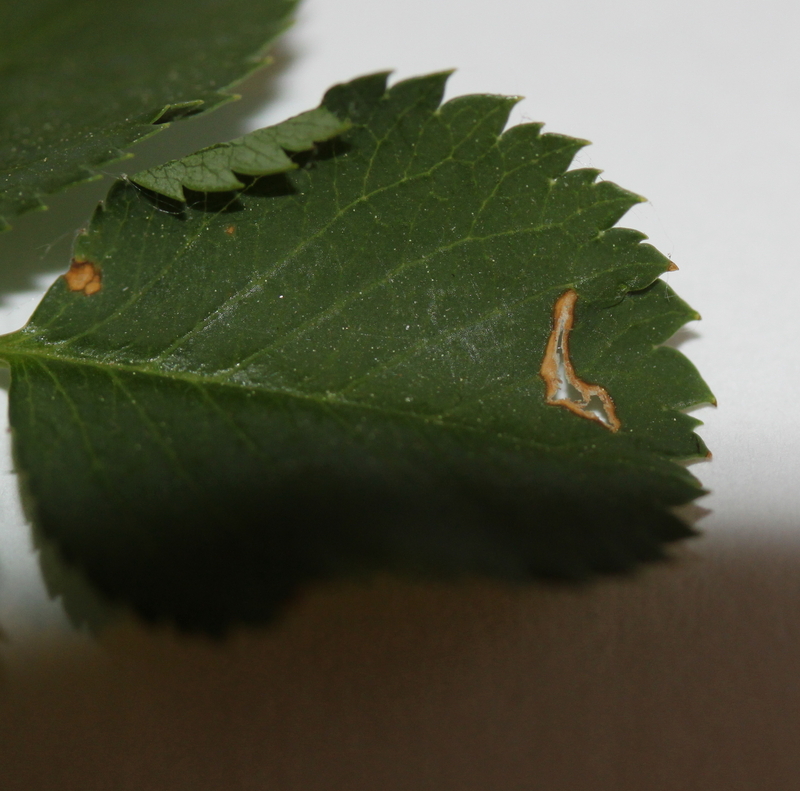 This entry was posted in Uncategorized and tagged Rosa fedtschenkoana, Rosa kokanica. Bookmark the permalink. Silk Road, not Spice Trail like I first typed.